HSA Walk-a-Thon is one of our largest and most popular fundraisers of the year. It is held each year in early February. All students participate in the Walk-a-Thon, which is held at Harbordale Elementary during school hours. 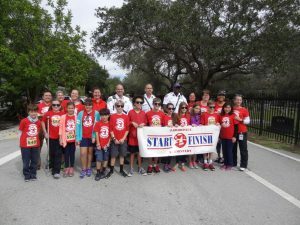 Walk-a-Thon 2018 raised over $14,000 in funds that are being directly used to impact the students and staff at Harbordale Elementary. We sincerely appreciate the support of the entire Harbordale community! Preparation for Walk-a-Thon 2019 is well underway! The walk will take place on February 1, 2019. Registration and pledge information was sent home in student’s red folders. Sponsorship opportunities are currently available through December 14th at 8:30am. Please see the Walk-a-Thon Sponsorship page for complete details or to register as a sponsor.